Witham Leisure Centre, based in Braintree, Essex is jointly run by the local council and Fusion Lifestyle, a specialist sports and leisure management organisation that is also a registered charity. Working in conjunction with local councils, school and communities, Fusion helps to deliver top quality sports facilities to a wide range of people. In 2011 Braintree Council granted planning permission for the new Witham Leisure Centre, replacing the outdated Bramston Sports Centre. The £9.5m project was to deliver improved facilities for the area and include a six-lane, 25-metre swimming pool and a separate learner pool, along with a fitness studio, dance studio, squash courts and 4 outside tennis courts. Designed by Scott Brownrigg and built by Barr Construction the leisure centre opened its doors in late 2014. Due to the nature of the construction, the contractor’s Barr Construction realised that some specialist services would be required, in particular for the construction of the 25-metre competition pool, learner pool and surrounding areas. Regulations surrounding the construction of swimming pools are very stringent and must meet the Health and Safety Executive and British Standard requirements. technical drawing package to cover the specialist pool tank tiling with plans, sections and details. 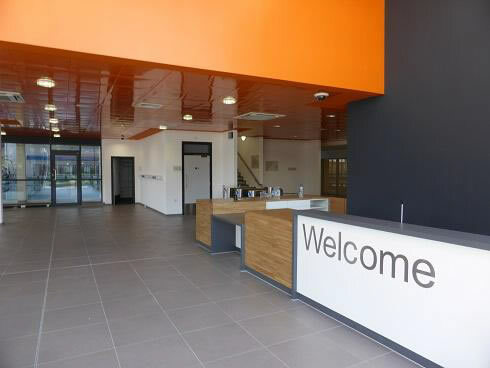 Jonathan Wood, Architect at Barr Construction says “We chose Spectile to deliver the Architectural Tiling package because of their expertise and choice of range. Their input into the design of the pools and their knowledge of HSE regulations for Anti-Slip Surfaces was invaluable. Combined with the ability to test and demonstrate the effectiveness of the Anti-Slip surfaces on site, Spectile Ltd were the clear choice for this project”. Spectile Ltd also offer post project completion services such as Pendulum Testing and maintenance advice. At Witham Leisure Centre, Spectile carried out on site Pendulum Testing and cleaning assessments to check that the completed project met the required standards, and would continue to do so through an appropriate care and maintenance schedule.